One of the more unusual constructions built in Campbelltown is the Universal Power House or Saturn's Rings perched high on a hill in the suburb of Eschol Park. Saturn's Rings was built by a Polish immigrant from Ingleburn named Stefan Dzwonnik. Construction began around 1979 and continued for some years after that. 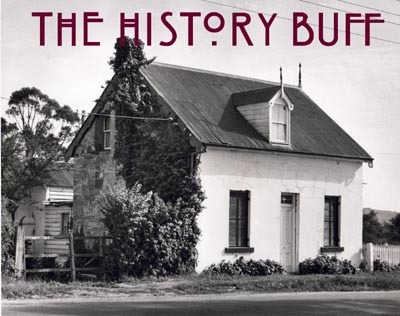 At the time the building was regarded as one of the most spectacular in New South Wales with a limitless, panoramic view of the surrounding countryside. So what was the purpose of this unique building? Stefan Dzwonnik had plans for it to be the mecca for a world-wide movement directed toward a better life on Earth. It was intended to become the home of him and his family; and the "power house" of his proposed Universal Power World Society. 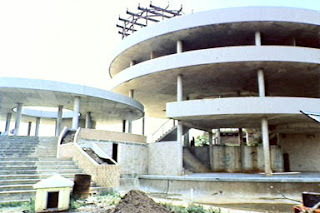 The unique design of the house was based on the rings of the planet Saturn and comprised three concentric units. The largest on the top level was to provide living quarters for the family. The two lower levels were for the society. Dzwonnik wrote a book around the time of construction called "The Universal Life Challenge". It discussed the Universal Power philosophy and outlined the aims and objectives of the society such as engaging in cultural and sporting activities and promotion of truth, love and peace. Saturn's Rings was never completed. When its frame used to be visible on the skyline, people would contemplate what is was, often mistaking it for a casino! It still sits on the hill at Eschol Park now virtually obliterated from public view by trees. My research leads me to believe that Stefan Dzwonnik moved from the area and is now living on the Far South Coast of New South Wales. Thanks for the article on Mt Universe. On my daily trips up Badgally Road to St Gregory's College, I used to always wonder what it was and if anyone lived in it. I take it there's no other photos with the dark/tinted ceiling to floor glass windows?? Thank you for your comments. It certainly is a fascinating story. No, unfortunately there are no photographs that we have or that I know of of the glass windows. I have a full 360 aerial video of the house from few days ago. Wasn’t sure what it was, now I know. Glad to clear it up for you! Andrew, did you go to Woodland Rd Public School? No I didn't. Only been in Campbelltown for the last 10 years. Can you find out if anyone lives there? Not sure about this Komi.Leave it with me and I'll see what I can find out. I was an appreciate carpentry at the time and saw this house first hand already abandoned in what I believe was 1975/1977 and I used to go and look at it on occasions for about 6 years my boss told me the tax department got him and thats why construction stopped. Hi Amanda, I'm in the process of trying to organize a visit to the site. There is someone I know that should know who owns it. Watch this space. Ooh, I'd like to join that visit if it eventuates. Hey Andrew any luck with organising that visit? I have walked up the mountain today and just before the house there is another gate, definitely looks like someone lives there at least 3 cars were parked there. Pretty much says who owns it, and it's impressive. But I'm sure we all would love to see pic's of the completed design! Thanks Trevor. I'll follow this up. Andrew, That would be awesome if we can see what the interior look like. i know that Stefan's son works in the strata industry in sydney so he should be easily contactable. I have read this blog and I am also very interested in turning up to the round house!! I will email you Stan so that I can be added to the list for when a tour date is organised. Thanks for letting me know Dave. Every source that I checked didn't mention it built as early as this. Having not been in the area at this time, I'll take your personal experience on board. Glad we could clear it up! Could you give the Macarthur Chronicle a call? 8832 1670. Thanks. Local Information Librarian at Campbelltown City Library. “The Red Menace” – Communism comes to Minto!